Coco&Me » Blog Archive » I cut my hair! Yesterday my lovely hairdresser friend Ms.M cut my hair short for me! Thank you so much Ms.M! This is in preparation for the chemo. In the hope of keeping as much hair as possible I’ll be wearing a ‘cold-cap’ which cools the scalp during chemotherapy to reduce the amount of drugs reaching the hair follicles. I’ll be wearing it before during & after the treatment & apparently it’s better to have short hair for it. Also, if hair does fall out it’ll be less dramatic when it’s shorter hair…! Hairdresser Ms.M chopped off 40cm! 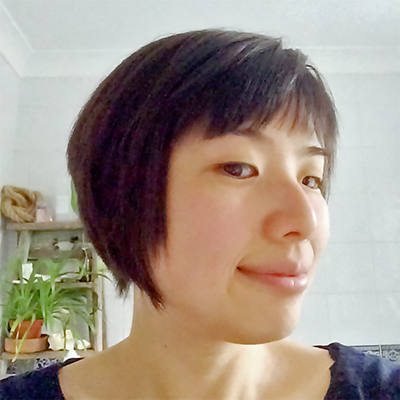 I decided to send the chopped off hair to a hair-donation charity called The Little Princess Trust. It’s a children’s cancer charity that supply real hair wigs to children suffering with cancer. Initially I was thinking of selling my hair but Ms.C’s comment on this blog about her teenage daughter donating her hair so willingly without wanting anything in return has inspired me to do the same. I also can not shake off a scene I saw of a little girl with bad hair loss innocently playing by the toys at the Great Ormond Street Hospital that I visited 2 weeks ago for my genetics test. Maybe my un-dyed Japanese hair can be of use to someone somewhere. Maybe in this way I can repay, even a little bit in a roundabout way towards the kindness given to me by so many people. Today is going to be a busy day. Next biggie date is going to be the chemo starting this Thursday…! Be positive and may God be with you and strengthen you. I had never seen your picture..you are so cute! Good luck for this long day today, all my thoughts are with you! Your new haircut is very おしゃれ! I hope your portacath surgery was relatively painless. I will keep you in my thoughts during your chemo treatments. がんばってね! The new hairstyle looks super cute on you Tamami. And your skin is so so beautiful. I am glad everything went well today. Good luck for the chemo, I hope it goes as well as we can hope. Just a heads up – the cold cap is going to be quite uncomfortable, my cousin had tried to use one but gave up because she could’t stand it. But she has a head full of glossy hair now so it all worked out anyway. It went well, but today I wake up with uncomfortable tension on my neck and chest where the port and its tubes are located… I’ve read in forums that this will go away after a while though. Re Chemo: again, in forums I have read about ladies who decided to not continue with the cold cap. I’m gonna try to persevere though, my children definitely prefer if I didn’t go completely bald (even if it is temporary) and also for my own vanity! Lol! I’m so sorry to hear that I missed you at the market…! But I’m happy that you have left a message here for the first time! Thank you for your support!!!! Hi Tamami I came by your website and was really sad to read this. I hope you get through your course of treatment. By reading the comments its lovely so many of your former and present customers have written, all wishing you well and urging you a full recovery! Oh Poornima!!!!!!!!!! Thank you thank you thank you for your blessed soul to check out on me! I had the first chemotherapy session over a week ago. Cold capped too, like we discussed about last time. I can understand why your cousin gave up on using it – it was torture! I sobbed half way through it, feeling down that I might have to give up and face bring bald, then, when I talked to the nurse who sat with me to slowly administer my drug that the cold pain is mainly in my forehead, he tilted it slightly backwards toward the neck and suddenly it was tolerable! By the time my son and my dad came to visit to collect me, I was able to laugh with them about how stupid I looked with the cap. The chemo drugs have worked too well on me it seems, I’ve been feeling extreme nausea (feeling sick but not enough to vomit) for 7 days straight. My white blood cells also felt its effectiveness & nose dived to 0.8. But no worries, it’s under control now! with antibiotics. Oh Tamami, I think about you every single day and I am sure all your readers do but I didn’t want to bother you with my questions when you must be tired and resting. I understand that chemotherapy is really tough, and I am so sorry for the pain and discomfort you are going through. But you will get through it and once you are cured, you can look back and feel so proud of yourself. I am glad you were able to keep the cap on, and now you know the position in which to keep it for your next session :). I asked my cousin about nausea and she said, ginger tea helps a bit. (She said boil water, add some fresh ginger juice and a bit of fresh lemon juice, a pinch of salt. Let it become comfortably warm, then add some honey and drink). I know you will probably not have the patience to make it but maybe someone can make it for you? Also I know some essential oils like lavender and bermagot help a bit with nausea. Please rest a lot and don’t do too much of research on the internet about your symptoms, they can sometimes drive you nuts. If you have a kindle and like reading, load it with good books to keep yourself distracted when needed. I just finished the new harry potter book, its quite nice if you are a fan. I really hope and pray that you feel better soon. Ahhh, thank you so much, it’s never ever a bother to be asked!! Re: ginger tea, yeah I keep hearing about it, I must go and get some! I do incorporate ginger in a lot of my cooking though, in combination with fish for example. And about Internet! More and more I realise that the information is often junk, copied and pasted such times that the claims are coloured differerently than the original, a bit like Chinese whispers. Some claims are simply not true but has grown legs and has travelled so much that it has popularised. – I also hate that I end up spending too much time being on the Internet – link after link. Sometimes I do come across interesting stuff but most of the time I come away 2 hours later with an emptier void. Ps; we are also reading the Harry Potter book right now. (Yup, we are also big fans!) We take turns to read out the parts. Pretty fun. We’re hoping to go to Harry Potter Tour one day! Hi Tamami, I have been a vivid reader of your blog. I can not bake to save life but I love to live it through your writing and pictures. My best wishes and good vibes to you. Take care and feel better. That’s awesome that you’ve left a message here, thank you for your time! It always makes me happy and proud to hear from the people that read this blog! :) *smile! *:) thank you for your well wishing! Undyed Japanese Hair sounds like a post punk band, haha. “Never mind, the roots are yours.” !!!! Thank you for this sentence… It’s consoling message resonates with me, what with the extreme hair loss that I’m going through this past week. Love your funny idea that it sounds like a punk band! I would buy their album! ;-) I bet the artwork on their cover will be awesome…! I do like your new look! Also much easier to handle, I suppose?! I also enjoyed your thoughts about healthy food (Blog-entry “What I can do”). In my opinion it is definately not as easy to determine what really IS unprocessed food as it used to be 10 years or so ago. Too bad that many of of them are still quite pricey. Hi Andreas! Cheers!!! ;-) and you’re right, it is so much more manageable! Before, I’ve always sported long straight hair, but it was easily tangly…! When my hair grows back, I’m so gonna enjoy different short hairstyles! One of the mum-friends recently got the sides shaved, which I really dig. About food – ditto your thought. Also, cooking from scratch with ingredients with good intentions (like fair trade and organic) is pricey too… It’s cheaper to eat crap!